A line from a song by a poodle permed, Swedish rock group seems unlikely inspiration for a video slot but that’s just what you’ll find in Big Time Gaming’s release, The Final Countdown. It’s a 6 reel, 4,096 ways to win game that comes with some cracking extras. Look out for cloned reels, clusters of multiplier wilds and 2 free spin features which come with added wild extras. If you like volatile action, then this really fits the bill. Take off on your PC, tablet or mobile from between 20p and £20 per spin. Soft rockers Europe sang about “heading for Venus” and it’s this blast off that forms the basis of this unusual slot. With a futuristic city in the background, you’ll see a giant rocket perched alongside the reels. There you’ll see A to 9 royal symbols as well as a collection of more rewarding gemstones. Top of the bill here is the purple jewel. Land 6 of these on adjacent reels for a payout of 25 times your stake. Helping to create the winning combinations is the woman which is the wild. This substitutes for all of the standard symbols. There are a couple of special extras that can certainly get things moving in the base game. Reel Clone feature – on any spin, you could see up to 4 reels merge so they all show the same matching symbols. This cloning can’t include reels 1 and 6 but can encompass any or all of reels 2, 3, 4 and 5. Clone Wilds feature – if you manage to land wild on a cloned reel, it can expand. Just how big that expanded wild turns out to be depends on how many cloned reels are active. You could see 2×2, 3×3 or even 4×4 wilds here. These come with multipliers too. Depending on the size you’ll be in line for a 4x, 27x or even 256x boost. Land 3 or more scatters on the same spin and you’ll trigger the feature round. You’ll then have the pick of 2 different features. 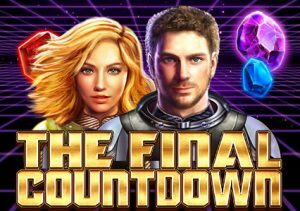 The Countdown Free Spins feature – choose this bonus and your reward is 8 free spins. The added extra is the presence of roaming 2×2 wilds that move around the reels on each free spin. Re-triggers are possible too if the countdown clock reaches zero. This can also result in the roaming wilds increasing in size to 3×3 or even 4×4 blocks. The roaming wilds also come with multipliers attached. Boosts of 4, 27 and 256x are again possible. Heading for Venus Free Spins feature – the second free spins round awards 15 free spins complete with cloned reels. Joining the action here are special velocity wilds that can send your payouts rocketing by a stratospheric 888x! Big Time Gaming showed that it could take a cult song and craft a very decent video slot from it in Danger: High Voltage. They’ve repeated the trick in The Final Countdown. The design doesn’t have much in the way of polish but it does the job well enough. Where this game excels is the potentially explosive extras. The cloned reels, blocks of wilds and multipliers can deliver plenty of action, especially during the free spins features. Be warned though. This is an extremely high variance game with top wins of 36,000 times your bet on every free spin! If the combination of exciting extras, a rocking soundtrack and extreme volatility appeal, then you’ll want to climb aboard The Final Countdown.